All transactions are safe and secure with a reliable history in online purchasing behind each of our associates. 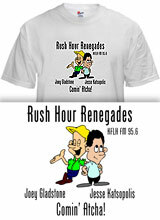 Buy the Rush Hour Renegades t-shirt to own Full House clothing and merchandise. Rush Hour Renegades, Comin' Atcha! Joey and Jesse often worked together and this gig was no different. They did a radio show on KFLH FM 95.6 and were an absolute hit. If you prefer Jesse by himself then check out the Jesse and The Rippers and Have Mercy tees that were designed for John Stamos enthusiasts. Couldn't get enough of Steph? Our How Rude t-shirt is ideal for fans of the adorable middle child. We have something for everyone so keep perusing. In addition to the Rush Hour Renegades tee above, browse the Full House Clothing Gallery for more apparel like men's and women's clothes, kids shirts or hoodies.